The Advanced Biofuel Center is a bioenergy crop research and development company that is meeting global demand for sustainable plant oil by working towards scientific commercialization of dedicated biodiesel crop that will lend credibility; reliability and scalability. With a fully integrated platform featuring a world-class leadership and science team, the most advanced multifeedstocks research into all aspects of nonfood energy farming crop improvement program in the industry and addressing the complete value chain, ABC is bringing the opportunities of nonfood oil to reality. We are an agricultural biotechnology, research and development entity developing and producing seeds of hope to produce renewable biodiesel feedstocks that can enable the large-scale replacement of petroleum and other fossil fuels. We use a combination of advanced plant breeding and biotechnology to develop new crops, known as dedicated energy crops, that we believe address the limitations of first-generation biodiesel feedstocks, such as corn and sugarcane, increase seeds and oil productivity, reduce crop inputs and improve cultivation on marginal land. Our first large-scale commercial products are proprietary Jatropha Curcas varieties that can be used as a “drop-in” feedstock. Our dedicated energy crops can also be used for the production of second-generation biofuels and bio-based chemicals, including cellulosic ethanol, butanol, jet fuel, diesel-like molecules and gasoline-like molecules, from non-food biodiesel. Finally, base load utility-scale electric power can also be generated from the biodiesel feedstocks grown from our seeds. As a producer of proprietary seeds, we believe we are in the most attractive segment of the biodiesel value chain — upstream from the capital intensive refining and conversion of biodiesel. Throughout history, plants have been subjected to changing climate, and farmers have adopted new species and varieties to meet the challenges; Cultivated or domesticated plants, when mankind propagates, plants and harvests them, have played significant roles in many of the advances that pure and applied botanical sciences have made in the last few centuries. Hybridization and selection have both been involved in the origin of crops and the process of domestication since early times. Analysis of the genetic, genomic and molecular basis of the traits selected by early growers that constitute the domestication syndrome in crops, such as loss of seed and increased organ size, has been a major focus of much recent research. Profound insights into traits associated with crop domestication have resulted from the technologies and discoveries made at ABC Level. Progress in the sciences related to crop domestication is the availability of well-characterized germplasm with ABC for understanding domestication as well as for plant breeding. We provide renewable technology and solutions to address the global demand for new economical sources of feed, food, fiber and fuel. Around the world, competition for fossil fuel reserves and growing concern for the environment have given rise to increased demand for bio-diesel crops. This represents a major business opportunity. But there are still challenges to overcome. At ABC, we believe the answer lies in efficiency. We can provide you with everything from initial feasibility studies through to project execution, training, support and crop management technologies. ABC offers to ensure its clients' long term success in the young but rapidly evolving renewable fuels industry. ABC has systematically assembled the resources necessary to facilitate this and to deliver turn-key business solutions.ABC has the Technical knowledge and plant science expertise, process engineering and operational expertise to plan, design and Create Failsafe Fuel Farms; deploy and commission Non-food vegetable oil refining and design and construct biodiesel plants. Our dedicated energy crops are developed to produce high seeds or oil yields per acre. For advanced biofuels, bio-based chemicals and biopower, we believe our high yield density crops will facilitate the construction of larger processing facilities because more feedstock could be collected from a defined area of land around the facility. In turn, these larger facilities will benefit from economies of scale, resulting in lower production and capital cost per gallon produced. Our dedicated energy crops can grow in a broad range of environments, including those not well-suited for most food crops. For example, our all dedicated nonfood energy crop need substantially less water and fertilizer than sugarcane to grow to harvestable maturity. We are developing biotech field trials that provide salt tolerance, drought tolerance and greater nitrogen use efficiency. We believe that by facilitating the use of marginal land, our crops will create opportunities for landowners who previously could not use their land as productively. Our energy crops are highly scalable, allowing us to match the production with growing demand as year by year increased yield of seeds is assured. Wee believe we are one of the only companies focused on dedicated energy crops with large portfolios of both germplasm and field-validated field trials. Our objective is to be the leading provider of dedicated energy crop technology, elite cultivar and expertise to the renewable energy industry .We plan to play a significant role in developing the second-generation biofuels and bio-based chemicals market, which we believe represents a significant opportunity. Our Pongamia Pinnata , Simarouba and Mahua products are specifically targeted at this market. We market our Nonfood Energy Crops brand as a symbol of quality, innovation and value across multiple biofuel, bio-based chemicals and biopower markets in a broad range of climates and geographies. We are continuing to develop innovative solutions using a broad range of technological tools, including genomics, biotechnology and proprietary bioinformatics in order to produce crop varieties with improved yields and other performance characteristics. CJP started commercial farming of Jatropha from wild selected seeds 1.0 in 2003 and now reached with improved enhanced Jatropha 3.0 with more oil and more yield. CJP scientists are continuously working on enhanced genetics, agronomics and horticulture sciences to drive new varieties, more knowledge around the plant’s nutritional requirements and more science-based processes for the care and custody of the plant and have achieved reliable and scalable results in Jatropha energy farming. Even a superior genotype variety planted in inadequate soil and improperly cared for, will be unable to reach its potential and will create dissatisfied stakeholders. The ABC’s goal is to triple Jatropha yields within 10 years, increase the oil content to 48 percent and in combination of other crops the target oil yield is 1500 gallon per ha. Further, to increase the quality of the oils and other products produced—while minimizing inputs including pesticides and fertilizers. 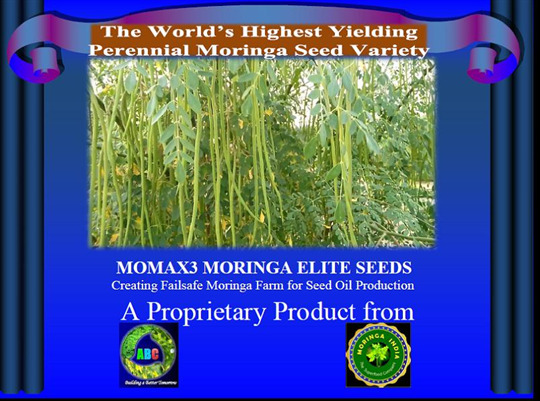 Advanced Biofuel Center has unveiled the Moringa oil industry’s most productive seeds worldly known as MOMAX3, which promise to deliver three times the yield of the industry average. The company says its ‘breakthrough’ seeds could help in establishment of Moringa Plantation for seeds oil production. The performance of plant varieties and field trials is influenced by the growing environment, which includes climate, day length, soil quality, pests, length of the growing season and crop management practices. The production of commercial-scale quantities of seeds requires the multiplication of the seeds through a succession of plantings and seed harvests The cost-effective production of high-quality high-volume quantities of some of our products depends on our ability to scale our production processes to produce seeds in sufficient quantity to meet demand. We at ABC have developed Crop specific Safe Care Technology with reference to practice of modern techniques coupled with scientific management. This will help getting more yield of better quality resulting into better revenue and profit. Moreover, for individual biodiesel crops we have complied a perfect set of publications which are the most important tools which you should have if you are going to take up the Biodiesel Project. Our integrated technology platforms are a combination of existing genetic assets biotechnology and bioinformatics. Integration of these platforms allows us to develop and commercialize new products from them. This combination of assets and research and development capability enables us to provide more fuel crops. Our early entry into the energy crop industry has allowed us to acquire access to valuable germplasm through strategic collaborations with leading institutions. We have a number of genotypes that have been shown to substantially increase oil yield and seeds yield per plant. We are currently field-trialing of these selected genotype in Jatropha, Pongamia,Moringa and in Simarouba. We have developed the technology that increase seed yield under normal and reduced nitrogen fertilizer conditions. In field trials, we have recorded steady yields on significantly less nitrogen fertilizer than normally used. Our technology allows plants to use water more efficiently and/or recover from water deficits more readily. We are currently field-testing water use efficiency and drought tolerance; this trait could provide greater yield stability for rain-fed crops as well as expand the geographic range where economic yields can be obtained. 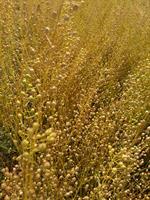 We have developed crops which can tolerate salty soil and enhanced recovery to both acute and prolonged salt stress. We are pursuing multiple approaches to regulate flower development for the purpose of increasing seeds, as well as rendering plants resistant to fungal diseases that infect flowers. KEY Strategy 8- Mapping Global Biofuel blending specifications & demand for Jatropha Oil. The CJP is working towards scientific commercialization of nonfood biodiesel trees/crops that will lend credibility; eliability and scalability with regards to food security, energy security and sustainable development and carbon savings. The CJP for Failsafe Energy Farming (www.jatrophaworld.org , www.jatrophabiodiesel.org ) was created in 2003 , the first entity to introduce commercial farming of Jatropha and since then working as a platform for multidisciplinary multifeedstocks research into all aspects of nonfood energy farming. The CJP intensified its collaborative research approach with regards to perennial oil seeds bearing tree like Pongamia Pinnata, Moringa oliferia, Jojoba, simarouba, etc. in combination with annual nonfood oil crops like castor, flax, safflower, camelina, etc to have more oil yield per ha and to improve their product. The CJP’s mission is to perform cutting-edge plant science research in genetics, breeding and horticulture, and further develop technologies to allow for the economic commercialization and sustainability of energy farms globally. In essence, CJP scientists are continuously working on enhanced genetics, agronomics and horticulture sciences to drive new varieties, more knowledge around the plant’s nutritional requirements and more science-based processes for the care and custody of the plant and have achieved reliable and scalable results in jatropha energy farming. CJP is the Global Consultant in the field of Biodiesel Project establishment providing consultancy at every stage of the project right from soil to preparation of complete plantation management and technical plan to plantation techniques/plantation execution and Setting up of Plant for Bio-Fuel including all plant & machinery required with all our best of potentiality and expertise. Our crops are new and most growers will require substantial instruction to successfully establish, grow and harvest crops grown from our seeds. As part of our product development activities and customer support, we provide agricultural producers and biodiesel procurers with information and protocols regarding the establishment, management, harvest, transportation and storage of our energy crops for use in biodiesel. In addition to seed selections, such crop management recommendations may include equipment selection, planting and harvest timing, application of crop protection chemicals or herbicides and storage systems. ABC has the privilege to provide most authoritative Knowledge platform known for Development of Sustainable Non-Food Oil Crop Projects, Programmes and Priorities to Feed Biodiesel Industry Worldwide and has established the Biodiesel Business AcademyÔ (BBA) to provide quality, impartial, informative and enjoyable advanced level training with enhanced technology in the field of Biodiesel production. The BBA delivers Training to international and national participants/professionals of green energy industry to increase and distribute knowledge and skills. I am attaching broachers detailing our programs and priorities. We provide Training to the participants in all matters, to successfully plant and harvest Biodiesel crops and process to produce biodiesel including how to plant, when to plant, when to harvest, who to extract oil and make biodiesel etc... We cover the full range of topics on agronomy, farming of various biodiesel feedstocks including manufacturing bio-oil/biodiesel, sustainable business planning, clean energy technology and corporate carbon reduction etc. CJP had its 1st, 2nd 3rd , 4th, 5th and 6th Global Jatropha Hi-Tech Agricultural Training Programme in India in Jaipur, Rajasthan from June 11-15, 2007, July-14-18, 2008, December 13-17, 2010, September 14-18, 2011, September 5-9, 2012 and September 23-27, 2013 respectively attended by more than 70 countries. were grand success. The word “Excellent”, which was used by many trainees to describe their experiences, sums up the JatrophaWorld Training experience. With Jatropha cultivation becoming an intensifying worldwide trend, how to ‘Do It IN Right Way’ dominated the entire training, with discussions centering on the best practices in Jatropha for maximum returns. All the Trainees who attended were glad to have had the opportunity to take their learning beyond the air-conditioned comfort of the conference room, and out into the actual field where they were able to see, touch, feel and do Jatropha planting first-hand. Some of the countries attended the global Programme are Angola, Algeria Argentina , Australia , Bangladesh , Belize, Burundi, Brazil, Cambodia , Canada, China , Colombia, Costa Rica , Ethiopia , Equator, Egypt, , , France , Germany, Ghana, Haiti, Hong Kong, Honduras , India, Iran, Ireland, Indonesia , Italy, Ivory Coast, Kenya , Lao PDR ,Libya, Mauritania, Morocco, Malaysia, Mexico,. New Zealand, Nigeria, Niger, Portugal , Peru, Pappua new Guinea, Singapore, Slovenia, Senegal, South Africa, Spain, Sri Lanka, Singapore, Switzerland , Spain, Tunisia, Thailand , Togo, Turkey, UK, USA, Uganda, Vietnam Yaman And Zambia. The 7th Biodiesel CropSphere 2018- Integrated Nonfood Biodiesel Farming & Technology Training Programme which is being held September 24-28 , 2018 at Jaipur, India, is mostly dedicated to multifeedstocks for building a sustainable biodiesel industry. The JatrophaWorld 2016 is designed to educate all stakeholders about critical issue of availability of right feedstock at right cost to make biodiesel a long-term business opportunity. Global JatrophaWorld 2018 marks the 7th edition with resounding success. We have developed a truly biologically-based Crop Management System for biodiesel crop on the basis Good Agricultural Practices with access to our own supply chain intellectual property rights (IPR) and exclusive expertise with technological background and experiences in the field for creation Failsafe Fuel Farm which can reduce consumption of fertilizer, pesticides and irrigation to a great extent. Farmers, growers and project developers today, both those in existing businesses and new entrants, live in an environment where they by necessity have to keep an eye on new opportunities. As well, diversification of cropping opportunities, within the limits of good business sense, provides an essential part of risk management in new Biodiesel feedstock farming. This ' nonfood biodiesel” is going to happen. We know there are a lot of farmers, entrepreneurs, and investors reading this who can cash in on this biodiesel craze. They are already doing it big time in Europe so it's just a matter of time before it happen worldwide using Jatropha and other nonfood oils to make biodiesel. This industry is going to grow very quickly - start planting Jatropha TODAY and then start making biodiesel to produce/generate your own fuel/electricity/power. With above steps —government support, scientific research, new funding, and effective project management—we can make significant progress in the near term to address the climate challenge and fossil fuel crisis through growing green energy from non-food sources. ABC is well positioned to play a leading role in the commercialization of green oil plantation and in sustainable growth in the production of biodiesel and environmental commodities. ABChas extensive on the ground experience in project implementation. The ABC has also strategically attracted and employed market leader executives to expand its management capabilities. ABC can provide the required technical expertise, management capacity, technologies and commercial focus to support widespread green fuel operations. We place integrity, trust and respect at the core of all we do. What need to do to venture into the growing business …? Just need a proactive approach. The Biodiesel Business Academy™ (BBA) has been established to provide quality, impartial, informative and enjoyable advanced level training with enhanced technology in the field of Biodiesel production. The BBA delivers Training to international and national participants/professionals of green energy industry to increase and distribute knowledge and skills. We, at BBA believe that biodiesel can reduce dependence on petroleum, help address climate change and boost domestic economies. Biodiesel from a variety of feedstocks can meet contemporary needs for environmental stewardship, economic prosperity, and quality of life without compromising the ability of future generations to meet these needs for them. We are confident that scientific advancements can demonstrate, preserve, and enhance biodiesel's ability to help meet the food, feed, fiber, and energy needs of the future. Our programs demand a great deal from both the faculty who create and deliver the courses and the business professionals who take them. We encourage applicants from established or emerging Green Energy companies who have been recommended by their organizations for leadership development. By participating, they will prepare for the next steps in their careers and lives demonstrating leadership here, in their classes and among their peers. Most important, they will return to their organizations with fresh ideas, new business skills, and a greater capacity for addressing the challenges their companies will face. Our growing economy requires business leadership across national boundaries and among teams that reflect many crops, climates, cultures and interests. In addition to biofuel business development courses that specifically address global business challenges, all Green Energy Education programs include course material rooted in practices and issues that span the world. We provide Training to the participants in all matters, to successfully plant and harvest Biodiesel crops and process to produce biodiesel including how to plant, when to plant, when to harvest, who to extract oil and make biodiesel etc... We cover the full range of topics on agronomy, farming of various biodiesel feedstocks including manufacturing bio-oil/biodiesel, sustainable business planning, clean energy technology and corporate carbon reduction etc. Given the active, participatory nature of BBA Green Energy Education programs, with whom you learn is as important as what you learn. We deliberately structure our biodiesel training programs to assure a vibrant mix of participants that represent diverse functions, industries, and geographic regions. In the biofuel business industry, every year brings new development, science, trends and challenges. While demand continues to grow, consumer needs shift, production challenges increase, and evolving technology impacts every part of the value chain. The complex network of businesses that brings food and other agricultural products to market must continually reconfigure itself in such a highly dynamic environment. This creates timely opportunities for those agro fuel business leaders who are ready to think innovatively—and move quickly. One way to improve the chances of making best bet decisions in Biodiesel Crop development is to base such decisions on the best possible information, evaluated in a non-emotional way, and to make these decisions in collaboration with other members of the supply chain. And after attending the 2/5 days course the participants can build a personal best bet list of Biodiesel Crops. it becomes possible because the BBA’s Global programme provides a far greater range of data, information and knowledge and ultimately to improve the chances of success for everyone by making better decisions. There are currently a number of Biodiesel Crop such as jojoba, castor, algae, pongamia, moringa and simarouba a learning opportunity that will continue to pay off commercially. BBA’s session provides more detail about Biodiesel Crop development by outlining the key strategies available to assist and encourage commercialization of Biodiesel Crop products. The course materials were originally developed in response to inquiries from individuals wanting to know about best bets among Biodiesel Crops. The exercise provides an introduction to the issues relevant to Biodiesel Crop development and demonstrates for participants the usefulness of sharing problem solving with others. Whatever role your organization plays in the complex world of Biodiesel, you need to be informed about current issues as well as emerging external trends that could impact the industry in the future. The BBA advanced Biofuel courses are designed to bring new insights and frameworks to Green Energy in every type of organization—including producers, processors, marketers, retailers, policymakers, and service providers. BBA’s teaching and research focus on biodiesel agribusiness enterprises, supply chain management and business development strategies. Over the last 10 years BBA has worked with new rural industries as both researcher and consultant. BBA’s contribution to the WORLD Nonfood Biodiesel industry is a model of how a new industry can guide its own future. BBA’s research interests for the past 10 years have focused on commercial innovation in the establishment of new Biodiesel feedstock industries. It manages the most visited Biodiesel Crops Website (www.jatrophabiodiesel.org ) and has facilitated short courses and spoken at conferences and workshops on new nonfood biodiesel industries across the globe. The BBA training programme are the one of the greatest opportunities to broaden your horizons, look into the future to see where biodiesel ibusiness is headed, and take those trends into account as you prepare to meet that future. It takes you outside your business, your region, and your country, which is important because what happens in the rest of the world really matters. This is where world biofuel leaders convene. At Biodiesel Business Academy, you will do more than prepare for the next step in your biodiesel business. You will develop the worldview, strategic skills, and leadership capacity to master the complex global challenges that face your company today. 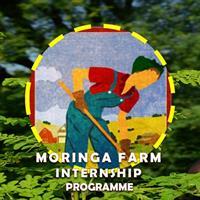 Compendium on "Establishing Moringa International Market "